Sowing of rabi crops was almost 3.41 per cent less than last year during the week ended January 4 as drought in the October-December period impacted the planting of pulses, mainly gram and coarse cereals. According to latest data from the department of agriculture, till Friday, rabi crops have been sown in around 56.44 million hectares which was around 1.99 million hectares less than the area covered during the same period last year. With rabi sowing almost 90 per cent complete and nearing its end in most parts, there is little chance of any sharp recovery in acreage. A big drop in acreage has been seen in the case of gram due to low area coverage in Maharashtra as it has been hit by drought. Coarse cereal acreage in the state and also in neighbouring Gujarat has seen a fall also due to low soil moisture. The area covered under gram till this week was around 9.3 million hectares. This is around 1.13 million hectares less than last year. Of this, around 0.61 million hectares is in Maharashtra alone. 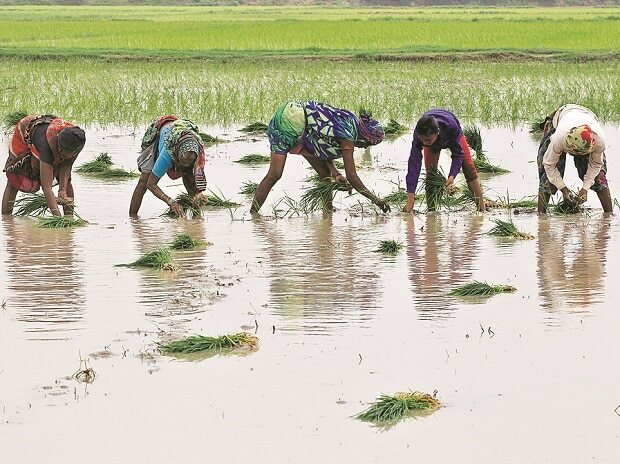 Acreage under rabi rice has also fallen by almost 25 per cent due to low rain in Tamil Nadu and Andhra Pradesh. 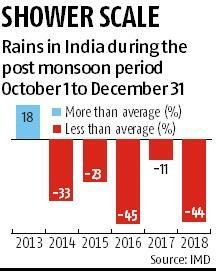 Between October and December 31, 2018, in the post monsoon period, the country received around 44 per cent less rain than normal. This, coupled with the drought in some parts, have impacted rabi sowing and could aggravate the distress in the farm sector. The southwest monsoon was almost 22 per cent below normal in the Marathwada region of Maharashtra, while in north interior Karnataka, the deficit was almost 29 per cent and 37 per cent below normal in Rayalseema. Sowing of wheat, the biggest foodgrain grown during the rabi season was, however, better than last. The crop was sown in around 28.83 million hectares, which is 1.7 per cent more than the area covered during the same period last year.